Wherefore art thou Alfa Romeo? "I said phone the RAC not the RSC!" 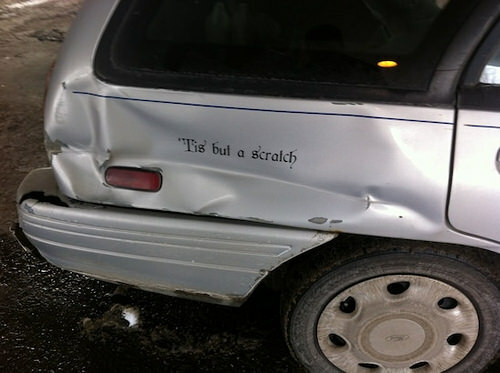 "Hast thou been in an accident that verily was not thy fault?" "Something is rotten in the estate of Dent-mark." "There may be more problems under the sonnet." No need to make a drama out of it. Mercutio's car. As Ambrose Bierce said, "Death is not the end. There remains the litigation over the estate". I backed into a round table. And to the person who did this, when I finish ripping your throat out, 'tis but a love-bite. "If you prick us, do we not bleed? If you tickle us, do we not laugh? If you poison us, do we not die? If you damage our car, you bloody well pay for it! The crumpled bonnet bears the phrase "'Tis a write off." "My other car is Old English White." "He cut me up, ha ha, there's a bit of poetic justice." The driving lesson went from bard to verse.